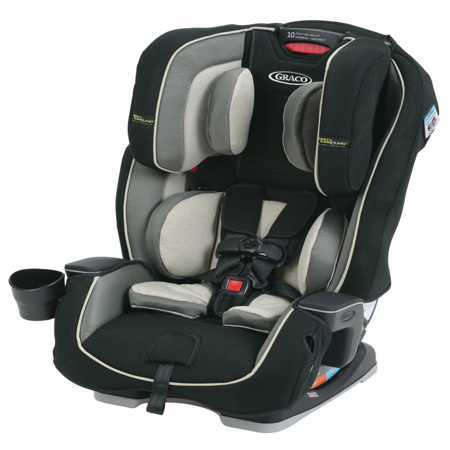 The Graco Milestone All-in-1 Convertible Car Seat featuring Safety Surround Side Impact Protection grows with your child. It’s three seats in one, for comfort at every stage (rear-facing from 5–40 lb, forward-facing car seat from 22–65 lb, and belt-positioning booster from 30-100 lb). With the Simply Safe Adjust Harness System, you’ll adjust the harness and headrest together, for an always-right fit, and Safety Surround Side Impact Protection provides the best head protection at every stage. The 4-position recline keeps your child comfortable, while the InRight LATCH system makes installation easy with a one-second attachment. The seat is side-impact tested and SafeSeat Engineered, giving you peace of mind. I just purchased this carseat today and installation was a cinch. I was able to do it on my own using the LATCH system. My 9 month old has outgrown his infant carrier (he is a really tall kiddo) and so far, he seems to like it. It was really simple to get him in and adjusted to that he is safe and comfy. I like the side impact head restraints and the fact that this is steel reinforced. I wish I had bought this months ago! We've been using this seat in both our vehicles for the last 1 1/2 years. Easy to install and strap adjustments are a breeze. Love that it goes from rear facing to high back booster seat. I bought this car seat for my grandson when he was 3 months old and he is now 3 years old and we are able to continue using the same car seat. Love it. BEST Carseat in Accident and Overall! I just bought this seat for my 2&4 year old girls about 4 months ago. Unfortunately we were in an accident yesterday and now I have to get new ones, but WILL be getting this SAME seat for both of them (when I can afford new ones)! It is SO safe, SO easy to install, and SO comfortable for my girls! I wouldn't recommend any other seat! Plus they are smaller in width, so easy to fit 3-across! I Bought this for my one year old grandson. It's very well made. Tons of cushion/padding. Great product. I'm a Safety Supervisor. Safety is paramount. Very safe and easy to install. Would definitely recommend to other parents. I bought this around my son's first birthday. We had bought a convertible car seat previously and I hated it. This car seat is easy to tighten and loosen and feels very secure. It is easy to install, we used the latch system but had zero problems tightening. My son is still rear-facing but he loves it. I wish I had bought this seat sooner. My only negative is I have a hard time seeing him in the mirror, but he is directly behind the driver seat. Easy install and last forever! This seat is by far one of the best convertible seats out there. Very easy to install and love the one hand harness adjuster. I've heard stories about the pain it can be to move the harness with having to rethread it through the seat. Another great aspect of the seat is the easily removable seat padding for washing. Will definitely last a while! My LO is 22 lbs @ 19 months and still have her rear facing and the seat still has plenty of growth for her to stay rear facing for a few years, but still seems to secure her since she is very petite. Couldn't be happier! So great we got a second for my husband's car. So far I love the carseat for my son I upgraded him from a babytrend infant carseat to this Graco milestone carseat.I just hope it was a little affordable because I need another carseat.